The date is getting closer and closer to Christmas: have you already thought about what to get the most important person in your life? Choosing the right gift for your girlfriend, for example, is sometimes really hard to do! The Christmas gift for your girlfriend has to be magical. It should be about her and say something sweet that she’ll never ever forget. What better idea than personalised jewellery? Something that’s unique and original and created just for her. Plus, everybody knows how much women love jewellery! To give you a 100% original Christmas gift idea, we’ve selected a few options that’ll really wow your girlfriend. 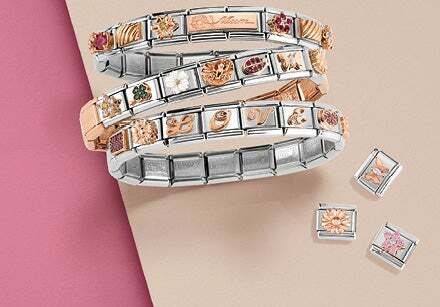 The materials used to create Nomination jewellery are always top choice: yellow and rose gold, silver, stainless steel, coloured gemstones and crystals are combined to create jewellery that has an original design and is always fashion forward. What to give your girlfriend for Christmas? Looking for glamorous jewellery that really shines? Discover the personalised necklaces from our SeiMia Collection: you will find pendants in the shape of letters to allow you to create the name of your beloved, charms, pendants and hanging decorations to make your jewellery gift for her truly unique – all studded with brilliant cubic zirconia stones. If instead you’re in search of a Christmas present for your girlfriend that’s a bit more colourful, choose one of the stretch bracelets with coloured Cubic Zirconia: the bracelet can be single-strand or double and there are many shades of crystals available. If you’re in search of Christmas gift ideas for girlfriends that are truly special, choose jewellery with a customised engraving: write her a sweet message for a Christmas that’ll be truly magical! Bracelets from the Extension Messages Collection are crafted in stainless steel and contain an engravable gold plaque: choose the symbol you want next to your message that’s best suited to your better half, like the tender heart with Cubic Zirconia or the infinity symbol. Or you could choose a bracelet that already contains one of our inscriptions that’s perfect for any special occasion. 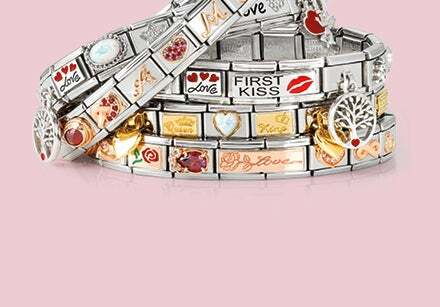 With the collection of Composable bracelets, Links and charms, on the other hand, you can create your own personalised jewellery to send a declaration of love to your partner: many precious tiles are available, dedicated to the most special moments in life, containing romantic messages and symbols to gift to your partner for a magical Christmas. In addition to the inscribed Links, you can add charms with precious coloured gemstones like rock crystal and coloured agate, or you could add the most enchanting symbols, made in yellow and rose gold. Discover all the a Composable bracelets built with romantic Links and Charms and choose the perfect surprise for her to find under the Christmas tree! From the My Angel bracelet decorated with elegant rose gold Links to the bracelet dedicated to living together, to the Composable Big bracelet that shares the tender story of a couple falling in love, just like you two.